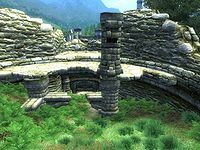 Fort Virtue is a small fort southwest of the Imperial City containing undead. It contains only one zone, Fort Virtue. There is a glitch with the gates in this dungeon which makes one part of the fort only accessible the first time you explore the dungeon. The levers that open the gates at E and F will each work only once. If you return to the dungeon a second time, both gates will be closed but the levers will not work. When you try to use the levers, you will get a message "The lever is stuck and will not budge." As a result, two chests cannot be accessed, and you need to retrace your steps in order to leave the dungeon. 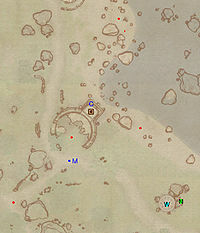 This location's map marker (M on map) is named Fort Virtue (editor name FortVirtueMapMarker). The entrance door is NNE of the marker, 110 feet away. The gate at E forces you to go through this dungeon in a counterclockwise direction. 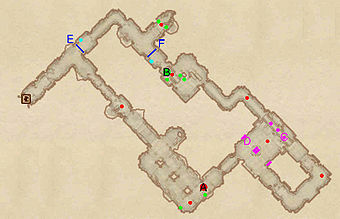 On your first time here, after reaching the boss chest (B) you will be able to open the gates at F and E using the adjacent levers (cyan dots) and quickly get back out of the dungeon. On subsequent trips, however, you will be forced to go back around the long way because the gates F and E will not open (see notes). 4 Dart traps at location D on map. There is no need to go through these dart traps: on the other side there are just two coffins containing clutter (bones, cheap clothes). However, the darts can on occasion be used to your advantage: they can be used to kill the enemy who spawns behind them. 3 Swinging Mace traps at C, along a bridge. Each of these traps is activated when you walk under it. If you are running fast enough you will completely avoid them. 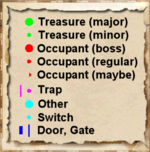 There are 2 Portcullis Gates at E and F. Each gate is activated by the adjacent lever (cyan dots on map). However, the levers will only work once (see notes).